Grave Robbers is a VERY FUNNY stand alone game for 2-6 players, and consists of 120 cards, rules, and the cute box it comes in. The game is "non-collectible", in that you don't have to buy more and more cards to compete like in Magic: The Gathering. However, there are some similarities in the ways that Grave Robbers and Magic work (Locations instead of Lands, Special Effects can be played much like Magic's Instants and Interrupts even if it is not your turn, plus other stuff - I don't want to give it all away). The cards consist of Characters (e.g. Bookish Girl with No Boyfriend and the Creepy Old Innkeeper), who are the cast of your movie, Creatures (including Dracula and the Blob Monster), who attack Characters, Props (Flashlight, Pistol, Book of the Dead), which can help Characters defend themselves (but also help certain Creatures to attack), Locations (Laboratory, The Sorority House), where the movies take place, Special Effects (Reinforcements and Let's Go Skinny Dipping, and SO many others...), and Roll the Credits, which when played ends the current hand. The player who has the most points, which is a combination of Characters he or she has in play, Props, Location, and other factors, is the winner. My wife and I first gave this game a shot over a few days we took off around the 2004 Thanksgiving holiday, and we truly loved it. If you have ever seen a movie by Sam Raimi, Ed Wood, Roger Corman, and a number of others, you're going to see some familiar lines and situations. The very title of the game is originally what Ed Wood's Plan 9 from Outer Space was to be called. Each card has a line written on it, many of them from actual B-movies, and you are supposed to read these aloud when you play each card. It is HILARIOUS, but also a real game that can be very competitive. As to ages this is appropriate for, the box says the game is rated PG-13. As silly as the game is, the horror themes might not be appropriate for younger ones. 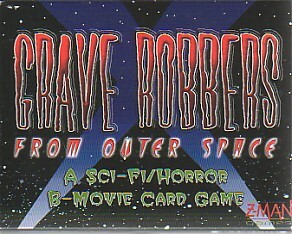 You can find Grave Robbers from Outer Space online for purchase here.